The NFL has collaborated with Latino Leaders Magazine and is proud to showcase and honor the top leadership figures who have influenced, inspired and impacted the Latino community. One of the greatest NFL players has also joined forces, NFL Hall of Famer Anthony Muñoz, is working to leave a long-lasting impact on the lives of our younger Latinos through programs and activities within the Muñoz Foundation. Additionally we are honoring business leaders across the country who display leadership, dedication, and love for the community. They will be receiving the NFL Hispanic Heritage Leadership Award and a $2,000 grant to aid an organization of their choice. Throughout Hispanic Heritage Month, you will also be able to visit www.NFL.com/HispanicHeritage to see how the NFL is joining the celebration with your favorite local team. Get to know past Hispanic players who have made a difference on and off the field. This month is your month to #FeelTheOrgullo! Nationwide has also partnered up with the NFL in support of the Hispanic Heritage Leadership Awards. It is the latest in a series of rich and authentic relationships with the Hispanic community. The Columbus-based insurance and financial services company already has partnerships with Latina Style, the United States Hispanic Chamber of Commerce, the Association of Latino Professionals For America, and Prospanica. Nationwide also provides resources, support and service to Hispanic consumers and business owners across the country. The sponsorship of Hispanic Heritage Leadership Awards aligns with Nationwide’s goal of partnering with organizations that share the company’s values of improving the lives of others and giving back to the community. The triumphant moment Anthony Muñoz stepped off the football field for the last time, was the humbling moment he knew his work was not done. As one of the greatest football players in the NFL and four-time Offensive Lineman of the Year, Muñoz aspires to be much more than just a legend in the NFL Hall of Fame. Muñoz is conscious of the urgent need of role models and mentors among Latinos. He has worked mentoring children and as a medical assistant in Mexico. However, Muñoz knows his work does not stop there. This former Cincinnati Bengal then created a foundation for youth with hope to create a wave of impact on the Latino community. These are the things that he’s hoping he’s one day remembered for. Those who are football fanatics know Muñoz as the Hall of Famer who played for 13 years with the Cincinnati Bengals. 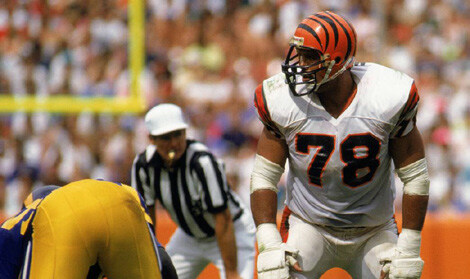 He was drafted as the third overall pick for the team in 1980 and played in two Super Bowls (The Bengals narrowly lost both games). He was always involved in community work during his seasons in the NFL, but after retirement, he decided to focus on equipping youth with skills for both on and off the gridiron. He began to put his ideas and dreams to work and in 2002, he created the Anthony Muñoz Foundation, a non-profit organization committed to helping the youth in the Cincinnati tri-state area. The foundation awards scholarships and hosts football camps and leadership seminars for young students who excel, as well as those who struggle academically. Since its launch, the foundation has raised more than $10 million for charities and programs. Muñoz said he learned about the importance of giving back to the Latino community from his mentors, including his mom. They have all been key players in the work Muñoz has done. He sees the foundation as a way to say thanks. This year, Muñoz is partnering with NFL Play 60 Character Camps, a program that teaches football skills and encourages exercise and strong character building. NFL Play 60 Character Camps expands this year to camps in 14 cities and will welcome about 300 youth— mostly Hispanic. These are selected leaders recognized through the NFL’s Hispanic Heritage Leadership Awards program, which highlights the contributions of Hispanic leaders in each NFL market. They will each be awarded $2,000 grant for an organization of their selection. This award aims to recognize the efforts and drive of these Hispanic leaders. Nationwide’s partnership with the NFL and support of the Hispanic Heritage Leadership Awards is the latest in a series of rich and authentic relationships with the Hispanic community. The sponsorship of Hispanic Heritage Leadership Awards aligns with Nationwide’s goal of partnering with organizations that share the company’s values of improving the lives of others and giving back to the community. Pastor Rusty Price has been an advocate of the Hispanic and greater Charlotte community for over 25 years. Pastor Price’s Camino Community Center currently oversees Bethesda Health Center (free clinic), Camino Pantry (groceries for families in crisis), Camino Thrift (retail fundraising/ donations) and the Way of Hope Homeless Ministry. Pastor Price has been instrumental in helping individuals and families address widespread needs from food, health, transportation and shelter to professional services. On behalf of Pastor Price, the Camino Community Center will be receiving a $2,000 grant. Is the Vice President and Executive Director of City Year New Orleans. City Year is a service organization devoted to keeping public education students in school and on track to graduate and is built on the belief through service we can demonstrate the power and idealism of young people, engage citizens to benefit the common good and develop young leaders of the next generation. In 2005, City Year Louisiana was founded in response to the overwhelming service needs following Hurricane Katrina. Today, they serve over 5,500 students in six New Orleans schools. On behalf of Peggy Mendoza, City Year New Orleans will be receiving a $2,000 grant. A breast cancer survivor and advocate, Awilda Diaz-Cruz was diagnosed with stage 3 inflammatory breast cancer in February 2014. She halted her career, and with the support of her family, Diaz-Cruz underwent chemotherapy and radiation, using her positive outlook to move forward. Her journey inspired her to get involved with the American Cancer Society. Today, she’s a strong supporter of Making Strides Against Cancer walks and works with Jersey City Medical Center’s support group to help patients find encouragement and hope. On behalf of Awilda Diaz-Cruz, the American Cancer Society will be receiving a $2,000 grant. President & CEO of the Latino Student Fund, Maria Fernanda Borja is passionate about education and under her leadership, the Latino Student Fund has launched and grown programs such as the LISTO College Prep Program that have created a difference in the lives of the students and their families. In 2017, Borja received the Non-Profit Leader of the Year award from The Greater Washington Hispanic Chamber of Commerce and was recognized by El Tiempo Latino’s Powermeter as one of the 100 Most Influential People for the Hispanic Community of the Washington D.C. Metro Area. On behalf of Maria Fernanda Borja, the Latino Student Fund will be receiving a $2,000 grant. Prior to NBCUniversal in October 2013, Cesar Conde was the President of Univision Networks. Social and community initiatives are core to Conde’s business approach and he has emphasized the importance of empowerment initiatives for the Hispanic community. He’s spearheaded a number of initiatives including the launch of El Poder En Ti, NBCUniversal Telemundo Enterprises’ robust community initiative aimed at empowering viewers to take action for a better life in three specific areas of key importance to U.S. Hispanics: education, health and finance, among others. Conde sits on the board of the Foundation for Excellence in Education and the White House Initiative on Educational Excellence for Hispanics. On behalf of Cesar Conde, Amigos for Kids will be receiving a $2,000 grant. Executive Director, LA Oportunidad, Inc. Originally from Colombia, South America, Eloisa has been living in Minnesota since 1988. She has dedicated most of these years to serve the Latino community in various leadership roles. She has been the Executive Director of La Oportunidad since 1998 and also produces & hosts its TV program En Familia (“Within Family”). For 30 years, La Oportunidad has provided bilingual and culturally relevant family-centered programs for Latino children, youth, adults and families. Through this work, the organization helps Latinos achieve educational and economic success; and close the achievement gap and break the cycle of poverty. On behalf of Eloisa Echávez, La Oportunidad will be receiving a $2,000 grant. As an active leader in her community, Garcia serves as the Chairwoman for the largest Latino Professional Organization in the country, ALPFA. Because of her vision and leadership, she’s tripled ALPFA’s membership, to a record high of 80,000 members. She also serves as the Chair of the Hispanic Scholarship Fund for Boston, and is the co-founding Chair of Milagros para Niños, a board at Children’s Hospital in Boston, which has raised more than $8.2 million in funds for Hispanic children who can’t afford medical care. On behalf of Yvonne Garcia, the Association of Latino Professionals for America (ALPFA) will be receiving a $2,000 grant.